How to expand on Left 4 Dead's strengths with an all new identity. How do you take down a colossal creature that constantly grows in strength? With help from three other friends, of course! 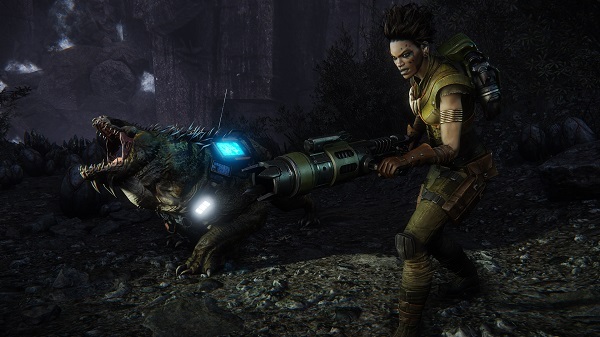 Turtle Rock Studios - the makers of the legendary co-op franchise Left 4 Dead - have released a spiritual successor in Evolve, an asymmetric shooter that carries over many of its gameplay elements from the developer’s landmark zombie-filled FPS. But has Evolve surpassed the near-perfection that Left 4 Dead established in the realm of co-op first-person shooters? The developers truly have created a game unlike many generic military shooters released in recent years. 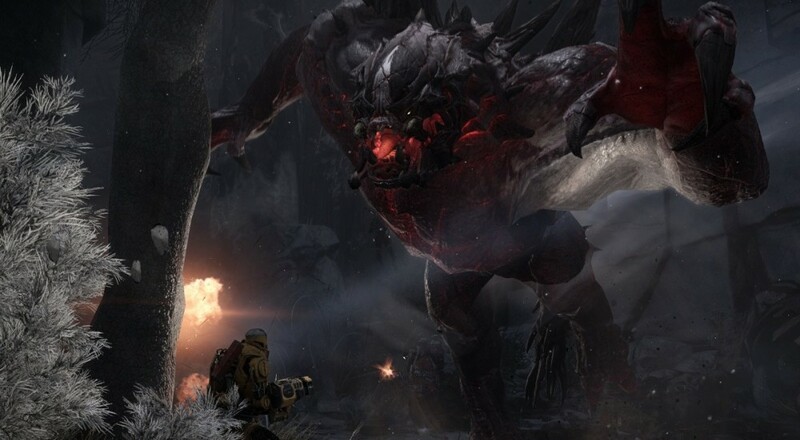 Evolve features a vast alien world occupied by two uneven teams; one consisting of the Hunters (humans who are trained to track down and kill large game) and the other being a Monster, a beast who's trying to reach its prime form and destroy its pursuers. I feel that Evolve works really well in accommodating both co-op and lone wolf players. 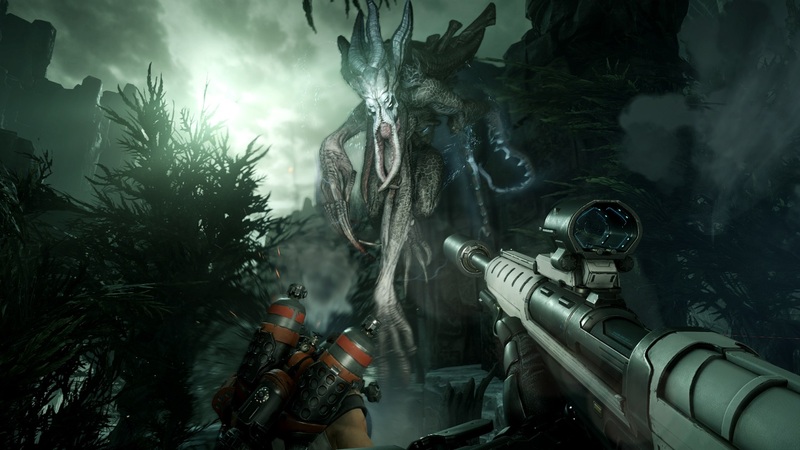 Evolve offers many varied game types such as "Defend", "Nest", and "Rescue" - all of which are fun in their own right. "Hunt," however, holds the bread and butter mechanics of the game. In this mode, the player controlling the Monster begins the game with a head start, giving it time to distance itself from the Hunters and feast on the surrounding wildlife in order to grow stronger. Soon, the Hunters freefall onto the battlefield and the chase is on. 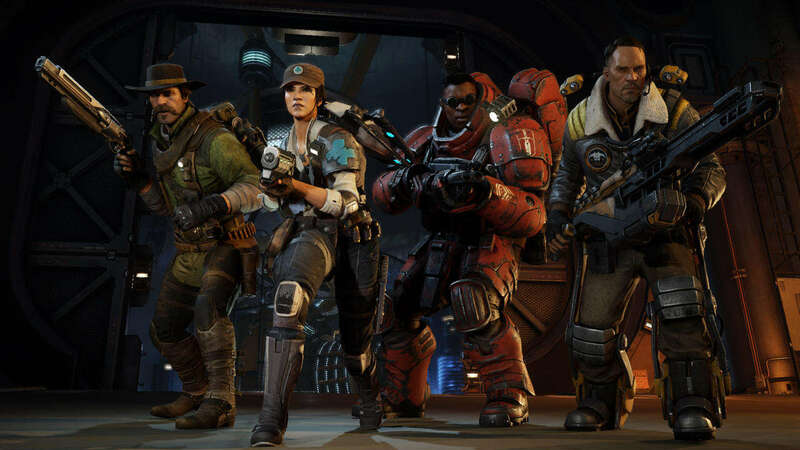 Each of the four Hunters serve different roles for the team, which is where the co-op elements in Evolve truly shine. The Assault class is equipped with enough firepower to deal heavy damage to the Monster, the Medic class keeps everyone as healthy as possible, the Trapper tracks down the Monster and traps it in a mobile dome, and the Support class...well...supports the team in various offensive and defensive ways. With three Hunters to choose from in each class - all carrying different skillsets (plus their standard class ability) - there's a lot of strategy that goes into crafting the perfect team. I was glad to see that Turtle Rock included this sort of customization, as I felt that it would’ve been a great addition for Left 4 Dead and its sequel. To get the most out of your team, the key is to choose the correct character for each class while keeping in mind the type of Monster in play. The player who assumes the Monster role has a choice of three beasts to play as: Goliath, Kraken, and Wraith (with more coming as DLC). For more of a ground-based, Left 4 Dead Tank-styled experience, players should pick the Goliath. If you prefer a long-range, aerial combat playstyle, the Kraken is the choice for you. Finally, the Wraith is for the sneakiest of players who thrive on hit-and-run tactics. Though I do enjoy leveling up characters and their perks through playing matches and using Hunter/Monster skills, there's little in terms of customization overall. I found that only about half of the perks available are really worthwhile during a game of Hunt; increasing your damage output or decreasing the recharge time for your jetpack are both crucial, while other skills are less so. Still, the game gives you plenty of options when it comes to perks, and supports a wide variety of play styles. Evolve really shines when played with a group of friends. However, I can easily see the game lose its luster over time, as the main objectives in each match rarely ever change. Hunter gameplay largely focuses on hunting and killing the Monster, though players can kill various breeds of wildlife to produce player limited-time buffs. This element wasn’t especially strong, though - I didn't find it very difficult to obtain a buff and keep it before finding another in a short time span (only one buff can be applied at a time). I also found that Hunters have to do an extreme amount of jetpacking to keep up with a good Monster player, and there’s not nearly enough time to close the gap. An experienced Monster requires the Hunters' Trapper or Support classes to be on their A-game most of the time and have keen insight as to where the Monster is traveling to next. For example, Daisy (the Hunter Maggie's alien pet) can seek out the Monster's exact location, but moves at such a slow pace that any skilled Monster player can easily sneak around, ingest animals, and take its time in evolving to its more powerful Stage 3 state without being discovered, giving the Monster a distinct advantage.